A much-celebrated icon of Hollywood, actor Mickey Rooney passed away on April 6, 2014, at the age of 93 at his residence in Los Angeles. Often noted for his lack of physical height, Rooney proved himself to be an industry titan, despite being only 5 ft. 3 in. tall, appearing in close to 300 films. He is believed to have had the longest active career in motion picture history. “I didn't ask to be short. I had tried to pretend being a little guy didn't matter. I tried to make up for [my stature] by affecting a strut and adopting the voice of a much bigger man... dating tall, beautiful women,” he stated. He married eight times, and chronicled much of his early career in his 1991 memoirs, “Life Is Too Short.” His various romances involved actresses Ava Gardner and Martha Vickers, as well as model Carolyn Mitchell. Rooney’s professional acting career began as a 6-year-old in the 1927 comedy short “Mickey’s Circus,” where he appeared as a ringmaster. The silent film had been considered lost to time until a little over a week ago, when it was uncovered with many other missing movies in the Netherlands and marked for preservation and restoration. Like Shirley Temple, Rooney started as a child actor, and decided to participate in on-screen entertainment throughout his entire life. For his achievements, he was nominated for the 1939, 1943 and 1956 Academy Awards for Best Actor in a Leading Role, and won the 1964 Golden Globe in the Best TV Star – Male category. His beloved roles include that of egomaniac Sammy Hogarth in 1957’s “The Comedian,” Andy Hardy in a series of 1930s and 1940s films and songwriter Mickey Moran in 1939’s “Babes in Arms,” a musical he made with frequent collaborator and co-star Judy Garland. Rooney was continually praised and recognized by other renowned Hollywood heavyweights over the course of his lifetime. His final film appearance will be in 2014’s “Night at the Museum 3,” which is scheduled for theatrical release on December 19. Rooney can be found in several movies airing on TCM in the coming days, including “Hide-Out,” at 12:45 p.m. EST on April 10 and “The Courtship of Andy Hardy” at 4:00 p.m. on April 12. Starting at 6 a.m. on April 13, and running through 4:30 a.m. April 14, TCM will be running a marathon of 13 Rooney classics. 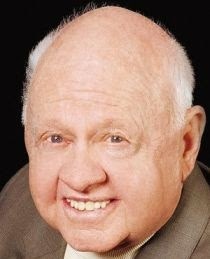 Very sad.. RIP Mickey Rooney. Aaron and I used to pretend to be Mickey & Judy all the time when we were younger. hollywood royalty. we <3 U. The legendary Mickey Rooney is dead at 93. Interviewed him many years ago. He was a hoot. A lovely man, talented actor & friend, Mickey Rooney has passed at 93. He is with his dear friend Judy Garland putting on shows in heaven. Mickey Rooney was an iconic movie star from the golden years of Hollywood. A time in movie history now past and unfortunately the absolute majority of stars from that period have now also passed. With the passing of Mickey Rooney another connection to the beginning stages of movies as talkies; through the great films of 1940’s and 1950s and on has gone. Mickey Rooney was there and entertained audiences for over 70 years - a true legend and star in every sense. He and all the other actors and actresses from a wonderful time in cinema history will forever be missed.